Four more established AFLW athletes have elected to fly with the Eagles until season 2021. Melissa Caulfield, Ashlee Atkins, Brianna Green and Courtney Guard will swap their chevrons for wings after inking contracts to become members of West Coast’s inaugural AFLW team. West Coast Eagles head of female football Adam Selwood believed the quartet would add plenty of experience to the team. “With the individual experiences each of these players have under their belt, we believe they have the ability to build resilience within the group and offer guidance to our young and developing players,” Selwood said. Caulfield will don blue and gold next year following 20 AFLW appearances for Fremantle across the past three years. The 31-year-old is an experienced outsider midfielder who reads the game exceptionally well, possesses a clean pair of hands and has the ability to push forward and kick a timely goal. Atkins, 25, lands in the Eagles’ nest after representing the Dockers for the past two AFLW seasons. The medium-sized forward has registered 13 games and slotted six goals at the highest level. She is renowned for her game sense, accurate use by hand and foot, plus her relentless forward pressure. Brianna Green is a cunning midfielder who has the versatility to move into defence when required. The 22-year-old has mustered just three senior games after succumbing to a series of unfortunate injuries. She broke her collarbone in the second round of season 2017 and suffered an ACL injury at training ahead of the Dockers’ round two clash with Brisbane last year. The East Fremantle product is progressing well through her rehabilitation program and is aiming to represent the Sharks in the upcoming WAFLW campaign to prepare her for season 2020. Courtney Guard is a diligent onball talent who got her first taste of AFLW action this year. The 2018 West Coast Eagles Female Academy member – who made her lone AFLW appearance against Adelaide in round four this year – exhibits natural leadership qualities and enjoys the heat of the contest. 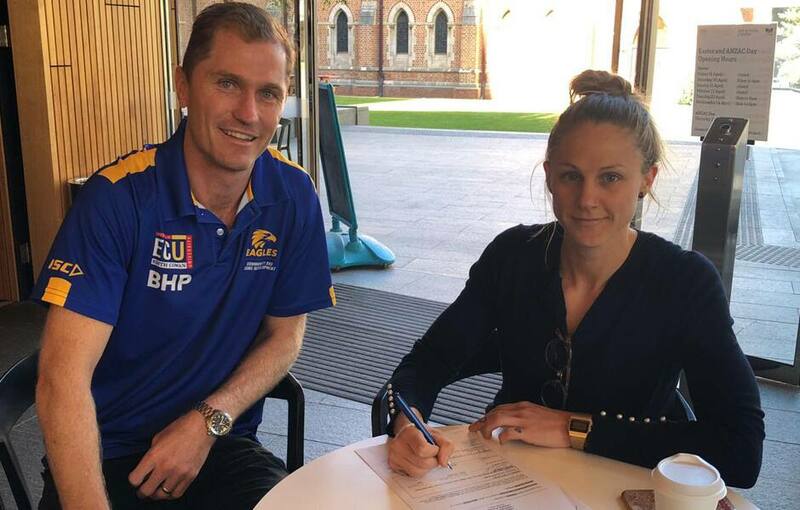 Guard last year formed a close connection with inaugural Eagles captain Ross Glendinning via weekly, one-on-one training sessions, which demonstrates her passion to improve as an individual.